I mentioned in my previous post that I was thinking about the idea of a 'handaxe roughout' as described in Shimelmitz, Barkai, and Gopher's paper on Qesem Cave. Their illustration is shown below. I want to use their description to persuade you that the idea of the 'handaxe' was not in the 'mind' of the hominid that chipped this piece of stone, but rather the 'handaxe' was in the mind of the hominids that named it so, S, B, and G.
But, you say, "Look at the beautifully photographed and artfully arranged collection of 'handaxes' in this next photograph. Surely there's no doubt that these objects were made using a mental template that demonstrates forethought and planning and immense skill!" I would have to agree, were it not for the immense variety of shapes that would be represented in this photo if you were to illustrate ALL of the bifaces from the same archaeological site. After all, the 'handaxe' is, first and foremost, a bifacially flaked piece of stone. 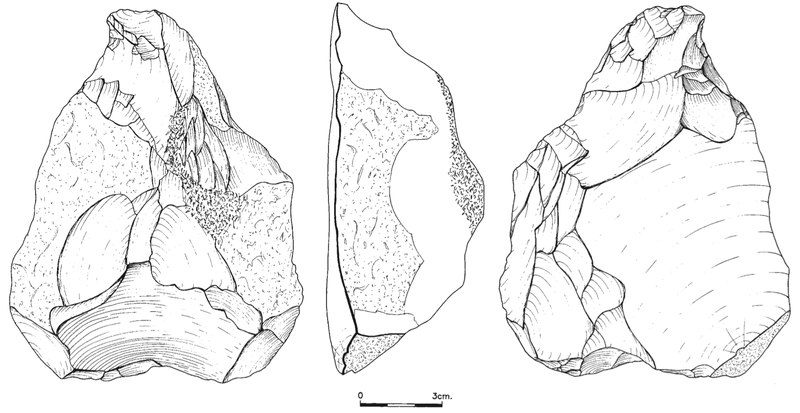 Notice that some of the Olorgesaile bifaces have rather blunted margins where the point would be if it were actually a 'handaxe.' These have come to be known as 'cleavers.' Some of the bifaces have convergent distal margins, like 'handaxes,' but the margins have been flaked such that they are now concave, leaving a point that stands out from the bulk of the artifact. These, they call 'picks.' Those, however, are just a few of the specimens. The rest don't have a shape that you or I can readily put a name to as belonging to some category of tool that we might have in our garage or kitchen drawer. In truth, not one of these bifaces has the same outline as the next. Absent the labels placed on them by earnest archaeologists, the range of variability is seen to be continuous. 'Discoids' grade into 'cleavers,' 'cleavers' grade into 'handaxes,' and 'handaxes' grade into 'picks.' 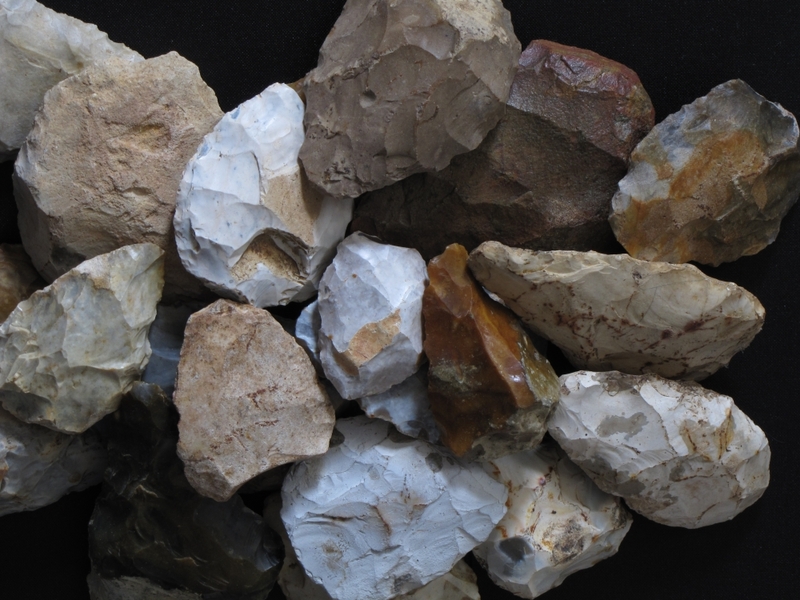 The 'handaxe'-ness is, therefore, only in the minds of the ones deciding what to call each artifact. Likewise, the 'cleaver'-ness. Likewise the 'pick'-ness. The only attribute that truthfully characterizes these artifacts is that they have been flaked on both surfaces and all the way around the margins. They're bifaces. Simple. No? Shimelmitz, Barkai, and Gopher see a handaxe in the largish piece of stone they call a 'roughout,' but it is only because they and generations of archaeologists have been used to thinking that the 'handaxe' or the 'cleaver' was the intended final product. What they would say about the shapes in between is that they're bifaces. The idea that these objects ARE 'handaxes,' 'cleavers,' 'picks,' 'hoes,' 'shovels,' or 'spaceships' (whatever you can think of to put a meaningful name to one of them) is, and always has been, a ludicrous proposition. Iain Davidson and Bill Noble are the only two people on the planet besides myself who've been crazy enough to float this argument. 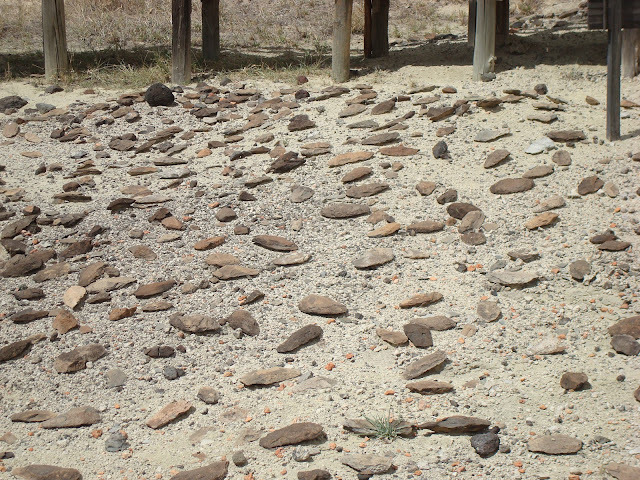 Theirs is much more sophisticated and includes stuff that lithic analysts would understand. But I'm not a lithic analyst...I'm a What completely amazes me is that there's even a need for such an argument, much less that there are only a few who feel the same way. Please pass this post around. You, the reader, are most likely the future of archaeology. Just as you wouldn't let someone drink and drive, don't let another generation of malleable minds grow up thinking that the handaxe is real!